Did you know that during the average Alaskan salmon fishery season over 150 million fish are caught weighing over 742 million pounds? The average profit is $230 million dollar, with some years hitting almost $800 million. The salmon industry is the most important fishery in Alaska. It can pay big bucks. The Alaskan salmon fishery is regulated by the Alaska Department of Fish and Game. It includes the commercial and recreational harvesting and processing of salmon caught off the coast of Alaska. It dictates opening and closing dates and times for each of the 5 species of salmon, the methods that can be used to catch them, and the region and locations where fish can be caught. Fishermen must follow the rules to keep the salmon population sustainable. Watch deckhands hauling in Bristol Bay sockeye salmon. Thousands of hard workers are needed every summer to earn their paychecks working on the fishing boats and processors of Alaska. Harvesting massive salmon runs and processing the fish is hard work, but well worth the effort. 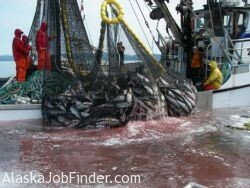 Landing a salmon fishery job provides an exciting chance to live the Alaskan life either on the water or in legendary seaports like Cordova, Ketchikan, Petersburg, Sitka, Seward, Homer, and Kodiak. If you’ve been pondering working in Alaska, the salmon fishery is a good place to start your job search. 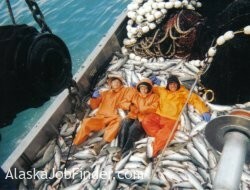 It’s easy to get your foot in the door so you can learn the ropes of the Alaskan fishing industry. You may start working in Alaskan salmon processing plants or need to do a bit of dock stomping to get on a boat – but once you’re in you’ll be hooked. Whether you are working on a boat or logging hours in a cannery or fresh frozen plant, every person in this fishery plays an important role. The first salmon season opens up in mid May and latest shuts down in October (except for a small winter king salmon fishery). The majority of jobs are available during the peak summer months, when over 31,000 people can find work on the Alaskan coast. There are always jobs out there for hard working folks. This million-dollar industry is a great place to spend a summer or a lifetime. Right now, pay is increasing. It is the highest it has been in decades. If you can find a job in the salmon fishery, you won’t regret it.